Defending against a Dark Art?. 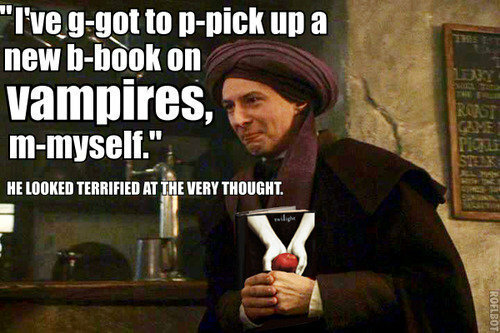 Quirrell, you're a fkn Defense Against the Dark Arts teacher. toi should know evil when toi see it. Unless you're using that 'book' as a learning tool, then that's a different story x]. Wallpaper and background images in the Harry Potter vs Twilight club tagged: quirrell twilight defense against the dark arts professor. This Harry Potter vs Twilight photo contains signe, affiche, texte, tableau noir, tableau, and affiches. There might also be journal, papier, magazine, tabloïd, chiffon, livre, rue, scène de ville, milieu urbain, ville, scène, urbain, cadre, mise en scène de rue, anime, bande dessinée, manga, and dessin animé. Vampires? Where in it are there vampires? VAMPIRES DON`T SPARKLE. RRAAAAAAAAAAARRRGH!! !